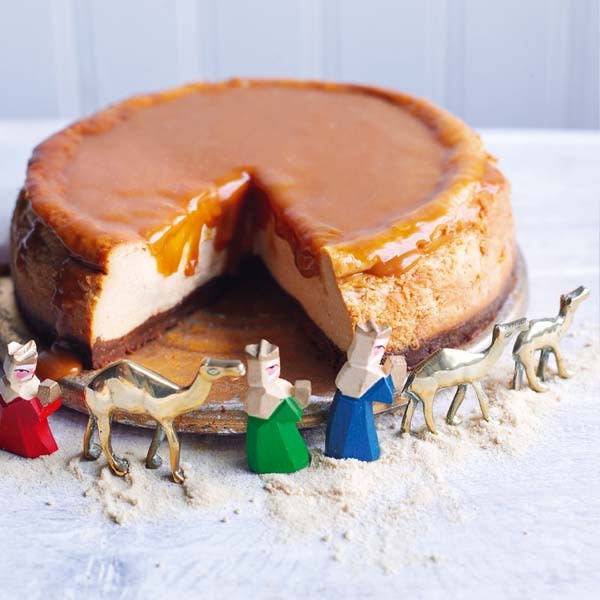 Try our salted caramel cheesecake recipe as an alternative to Christmas pudding or as a dinner party dessert. Preheat the oven to 160°C/fan140°C/gas 3. Lightly oil a 20cm loose-bottomed cake tin. Whizz the biscuits and cocoa to fine crumbs in a food processor. Add the butter and whizz until the mixture has the texture of wet sand, then press into the bottom of the cake tin. Chill the base while you make the filling. For the filling, whip the cream cheese, soured cream and caramel in a large bowl. Add sea salt to taste. Lightly beat in the eggs and yolks until smooth, then pour on top of the biscuit base. Smooth the top, then bake for 1¼-1½ hours until the cheesecake is cooked but still has a good wobble in the middle. Don’t worry if it puffs up and cracks a bit – it will sink back down as it cools. When cooked, take the cheesecake out of the oven and leave to cool in the tin for 45 minutes, then remove from the tin and chill overnight. To make the glaze, put the sugar in a heavy-based frying pan over a low heat and melt, without stirring, until it turns a rich red caramel colour. Add the cream and butter, stirring constantly (be careful in case it spits) until combined. Leave to cool for a few minutes, stirring often. Add a little salt to taste if you like. To serve, drizzle the caramel over the top, then cut into wedges. You can make the cheesecake up to 2 days ahead, but don’t make the caramel until the last minute. I love this recipe because it combines my all time favourite salted caramel with cheesecake. An easy, indulgent way to spoil myself. I love this recipe because it makes me salivate just at the thought of it!